Criminal thinking errors are pervasive in our society. Everyone has them to some degree, but the extreme criminal thinker relies on this way of thinking to justify their actions which support a criminal life style. 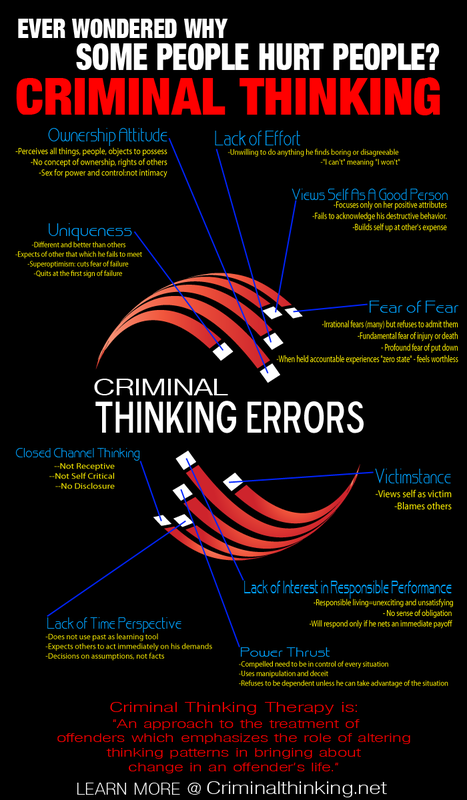 This entry was posted in Thinking Errors and tagged cbt, criminal thinking, infographic, thinking errors. Bookmark the permalink. 7 Responses to Why Do Some People Hurt People? Interesting. Many of these also fit my narcissistic father, who has passed away. Lots of criminal thinking errors in narcissistic thinking as well. I must be a criminal as I have all of these traits. This is continually being modeled for us on TV – perhaps this is one reason why the same behavior is becoming more prevalent in American society. Hi Richard, definitely agree these criminal thinking errors are prevalent on all major media channels!